Fever with ear infections are extremely common in children, and while they are not normally serious, if left alone worse problems may develop. The Eustachian tubes in children are not fully developed and are prone to fluid buildup, and if not treated this buildup can lead to hearing loss or severe infection. If you see signs that indicate your child may be having difficulty hearing or any other signs that may indicate an ear infection, don’t hesitate to take them to a doctor for examination. Our doctors at Pediatric ENT Associates in Birmingham are skilled at diagnosing and treating all types of ear infections at all ages. Treatments for ear infections will depend on a number of factors, including the age of the child and the severity of the infection. In some cases, ear infections will clear up on their own with no treatment necessary save for pain management, which can be accomplished with over the counter children’s pain medications or a warm compress to the ear. In most cases, however, antibiotics will be prescribed to fight the infection. Older children may also benefit from eardrops; however, children under 2 should not be treated with ear drops unless specifically advised to do so by your doctor. Chronic ear infections in young children may require more intensive treatment. Myringotomy tubes, colloquially known as ear tubes, are a fairly common treatment option for children who suffer from chronic ear infections. Myringotomy tubes help fluid drain from the ear, so that it doesn’t build up and cause more problems. The procedure to put the tubes in is a short outpatient surgery, and many children benefit from it. Surgical procedures can be scary for both parents and children, but your Pediatric ENT Associates doctor in Birmingham will be with you every step of the way to make sure that everything goes smoothly and that you and your child are comfortable. To learn more about fever with ear infection treatment, visit WebMD.com. Fluid buildup from an ear infection can result in temporary hearing loss that may become permanent if not treated in a timely manner. Signs that your child may be suffering from hearing loss include not responding to their name or too loud noises, turning the volume way up on the TV or stereo, not responding to changes in tone, not following simple commands, and performing poorly in school. If caught early enough, temporary hearing loss is often reversible if caused by an ear infection or ear wax buildup. However, if left alone, it can become permanent. There are solutions for permanent hearing loss, though, which include hearing aids and even cochlear implants. 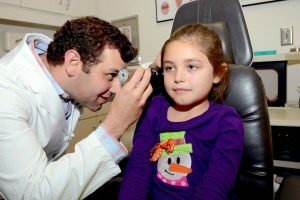 Your doctor in Birmingham will work closely with you and your child to determine the best course of action in the case of hearing loss. If you think your child is suffering from a fever with ear infection, don’t hesitate to contact Pediatric ENT Associates in Birmingham for a diagnosis and treatment plan. To learn more about ear infections and to make your appointment, just call 205.315.5633 today!